A true love story about a girl and her bird. When Shannon Cutts and Pearl first meet, she is still mourning the sudden passing of her first cockatiel, Jacob. The last thing she wants to do is to fall in love with another baby parrot! But one look at the tiny grey ball of fluff and Shannon just knows–he is love with wings, and they are meant to be together. A lifelong parrot lover but by no means experienced at caring for cockatiels, Shannon quickly assumes the role of eager student, with Pearl as her willing and equally eager teacher. 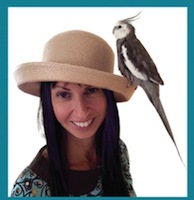 From negotiating victuals preferences to socializing with the parrot-phobic, making home improvements to avoiding the dreaded V.E.T., Shannon learns from her feathery sidekick how to meet his basic needs, offer extra enrichment, nurture and care for him, and be nurtured and cared for in return. Today, 12 years after their first meeting, Shannon and Pearl are still blissfully joined at the beak. Love & Feathers, a book based on the popular blog by the same name, is their story. Shannon Cutts is first and foremost a birdie and tortoise mama. She is also a writer, speaker, nonprofit founder, mentor, lover of retro threads, and champion of all things (and beings) recovered and recovering. Love & Feathers is her second book.